It goes without saying that Cubans know music, yet this public, appreciative of fine symphony, enchanting tango and classic rock music, may be sterotyped as being followers of only rumba and salsa dancing. If any doubt about the matter remains, questions should be directed to the U.S. rock band The Dead Daisies. Indeed, this super-group saw first-handthat not only do Cubans really rock, but also enjoy singing along to many of the classics of a genre theoretically far from tropical tastes. The band´s concerts at Havana´s Maxim Rock Theater and La Tropical demonstrated that Cubans do appreciate genres like blues and heavy metal. They were also pleasantly taken aback when a Cuban mosaic of ages wholeheartedly joined them in their rendition of All Right Now, the Free classic. 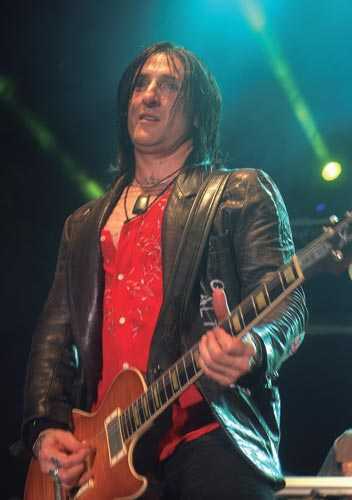 For Guns N’ Roses guitarist, Ricard Fortus, however, it did not come as a surprise. In the days prior to the concert he had developed high expectations of his Cuban fans and he confirmed that they had duly obliged. These musicians were just getting to know Cubans who had known them for many years through their membership of cult bands such as the Rolling Stones, Guns N’ Roses, Ozzy Osborne, Thin Lizzy, INXS and Motley Crue. In fact, the only novelty for the host fans was to see them live. This is not, despite having been sporadic in nature, a new phenomenon. Exactly 10 years ago, the U.S. band Audioslave attracted tens of thousands of rock lovers to the Havana Malecón, to enjoy an explosive cocktail of rock, blues, grunge, and metal during one the most memorable concerts of all times. Five years later, Kool and the Gang arrived in this capital to pay a sentimental long outstanding debt to the many Cubans who grooved to the funky sound as if they had traveled back through time and their younger years. Something along those same lines happened when romantics heard Air Supply or the Salvadorian Alvaro Torres. The defunct Leo Brouwer Chamber Music Festival also used to bring some cult genre giants, like the cellist Yo Yo Ma. The Swiss, Set Philippe Cohen, of Gotan Project, an emblem of world music, was also here recently as were innumerable other artists visiting not only to perform their art, but also to take in Cuba´s rhythmic sounds. Every year, different Cuban cities host festivals and events that celebrate diverse artistic manifestations. This explains why scholar Fernado Ortiz described Cuban culture as an “ajiaco” (traditional stew), a national dish made with a wide variety of ingredients…. delicious and eternally satisfying.